As it moves into the home strait with these, the final six episodes in the series, Tiger & Bunny continues to keep the focus on its greatest strength: Kotetsu T. Kaburabi alias Wild Tiger, the veteran half of the titular super-heroic duo. Perenially goofy, less than reliable, often outright unlikeable, yet in the end hard not to root for, Kotetsu finds himself in a corner as Hero TV's architect Albert Maverick, the mastermind behind the murder of Barnaby's parents, pulls his master stroke. With Barnaby manipulated and the other heroes mind-controlled into believing he's a murderer, Kotetsu has to resort to some bizarre extremes to turn events in his favour. If you've followed the series up to now you'll anticipate that since this is Kotetsu we're talking about, the scheme he comes up with is so ridiculous, threadbare and ill-thought-out it could only work in the four-colour universe of a superhero comic. Like the best protagonists, though, Kotetsu manages to make the world of Tiger & Bunny dance to his tune even when he's not in control of events, and the resolution to this particular plotline draws upon his relationship with the other characters to sentimental, yet fitting effect. While the series' habit of relegating the colourful cast of heroes to supporting status in Tiger and Barnaby's story has produced a few missed opportunities, it ultimately makes sense to keep the focus so firmly in one place when the intent is to produce this kind of effect. Even the rather anticlimactic resolution feels in keeping with Kotetsu's half-assed approach, though that might be being over-generous to the writing. The story doesn't end here, though – Barnaby's still under the thumb of the manipulative Albert Maverick, who brings a discarded villain on side to help shut down the Sternbild heroes once and for all. The death-trap and battle to the finish that follow are pure superhero comic material, and not for the first time one wishes that the inventiveness on display throughout the series could have been applied more effectively to the plot, since the emotional beats and twists that feature in the final few episodes are rather easy to predict. The big finish is satisfying enough, and has a poignancy only achieved thanks to the series' motif of accepting age and loss of one's former glory, something rarely seen in the ageless perpetual present of Western superhero stories. The production is of the fine standard on display throughout the series, and the voice cast on the English and Japanese audio tracks deserve a special mention for creating a memorable ensemble in both languages. 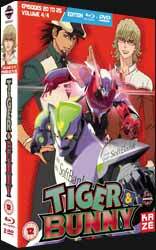 A high-prestige release from Kazé in line with the previous volumes means that Tiger & Bunny adds up to a pretty-looking collection of one of the more enjoyable series in recent memory.